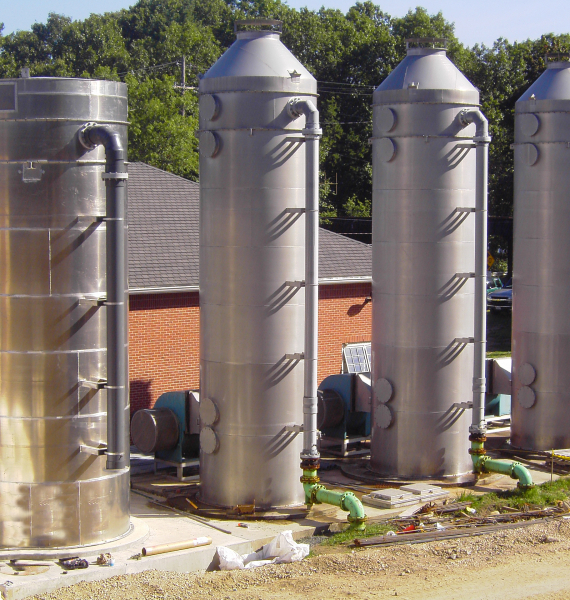 Vanguard® Air Strippers & Degassifiers | Manufacturers of Cooling Towers & Systems | Delta Cooling Towers, Inc.
Vanguard® Air Strippers are custom designed up to 15 foot diameter and 4000 GPM per column. 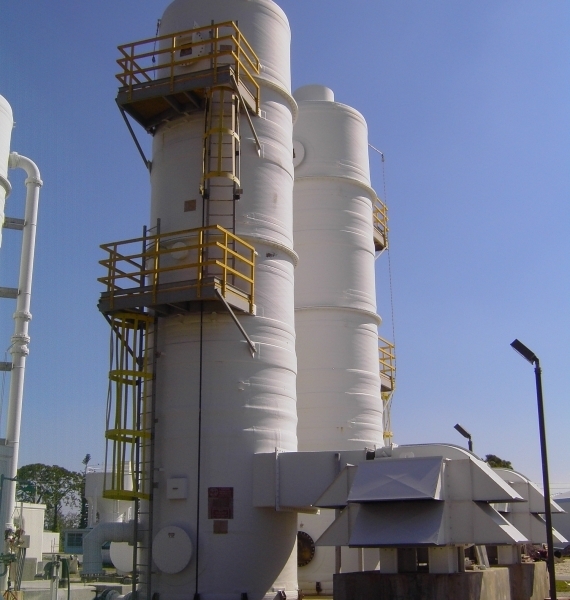 Delta has provided innovative and economical air stripping solutions to more than 500 installations since our first Air Stripping Tower was delivered almost 40 years ago in 1981. Today, air stripping continues to be the preferred water remediation technology for removal of organic solvents, chlorinated hydrocarbons, fuel/gasoline hydrocarbons, degreasers, and certain other volatile organic chemicals (VOCs), because it is the most cost effective when considering Initial, Operating, and Maintenance costs. Delta’s broad knowledge and vast experience has enabled the company to continually develop and refine the Delta Vanguard® line of standard air stripping towers. Delta’s Vanguard® Air Stripper Systems are preferred for routine installations as well as for many applications with difficult to strip chemical compounds. VANGUARD® air stripping towers are forced draft air stripping towers with single unit capacities from 60 to 4,000 gallons per minute. Delta air strippers are designed to remove volatile organic chemicals and certain other substances from water. 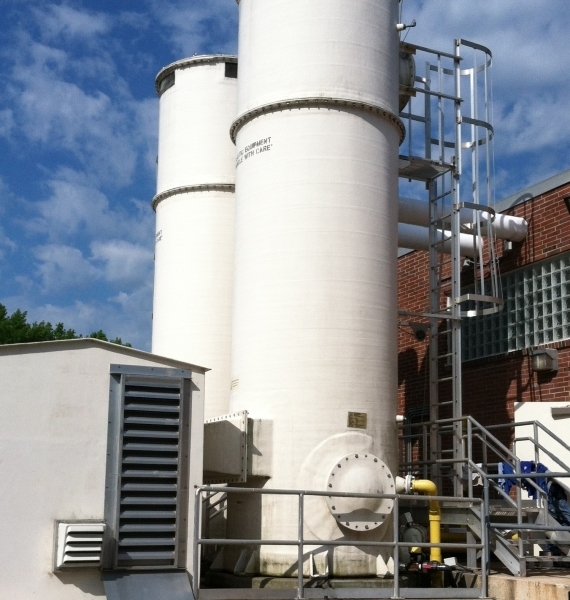 These towers are a unique design that Delta Cooling Towers have been very well received in both commercial and industrial applications. The towers operate on a countercurrent forced draft design. A blower, ducted into the sump plenum provides air at a slight positive pressure and forces it to flow upward against the water trickling downward through the packing. As the air passes over the water, spread over the packing surface as a thin film, the molecules of contamination cross the air to water interface and enter the air stream. The air then exits the column either to atmosphere or to some means of vapor phase offgas treatment. Delta VANGUARD® air stripping towers are available in most accepted materials of construction; aluminum, stainless steel, or fiberglass. Random packed medias are offered as well as our own Delta-Pak® structured packing. Delta VANGUARD® air strippers possess known, predetermined stripping performance and operational characteristics based upon field and pilot test data obtained from certified test laboratories. The quality and performance of these systems is evidenced by our more than 500 installations worldwide.